Jazz is the music of America. More than other musical form, it is our own: born with us, growing and coming of age as we have, telling the story of the American dream in its beats and rhythms. 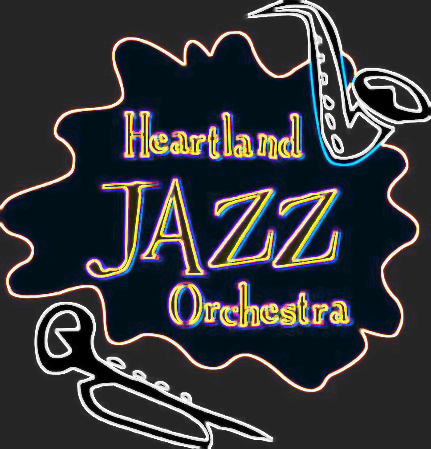 The Heartland Jazz Orchestra is an ensemble that is well aware of its music’s prominent place in the annals of American music history, and it is working to carry on that tradition and to establish a strong jazz community here in the Bloomington-Normal area. Chartered February 1999, HJO is comprised of a widely diverse mix of are individuals – from students, to teachers, to retirees. The 22-member orchestra has one thing firmly in common: a love for their music and a powerful command of their instruments. “Our main goal has been to create an institution that gives tribute to America’s jazz movement and the unique contribution it has mad to world music, and to support and further the jazz movement here in our home community” says the group’s founder and leader, Doug Tidaback, who also plays trombone. “Other forms of music have really lost that sense of spontaneity. That is one of the things that makes jazz so exciting it never gets played the same way twice,” he says. It is that belief in the improvisational strength of jazz music and the group’s love of audience participation that has prompted the HJO to record their debut CD album live at downtown Normal’s The Coffeehouse, in two sessions: from 7 to 9:30p.m. today and Saturday. The band will be performing two sets each night, each one made up of songs from the masters of jazz, Miller, Benny Goodman, Woody Herman and others. Horine’s Piano’s Plus is supplying a grand piano for the event, with Audioquest Recording, Pro Sound and Music Shoppe providing the lighting and recording services. “We are a group with a strong sense of community because we are diverse, but also because every member of this orchestra has really stride to become a creative complete musician, while still complementing the talents of each others,” say Luciano Rosado, veteran trumpet player and HJO business manager. The band hopes in the near future to be able to spawn a second group so that even more musicians can be given a chance to perform. For any style of music, even one as time-honored and relevant as jazz, sustaining it through the duration of time and changing cultures isn’t easy. Talented and passionate musicians must continue to aspire to keep the spirit and enthusiasm for their art form alive. With the arrival of the Heartland Jazz Orchestra, the art form appears to be in safe hands in Bloomington-Normal.